Howden Ganley (born 1941) came into F1 with a reasonably impressive record but during his 35 starts between 1971 and 1974, he never quite managed to break out of the midfield. His first point came during F1’s closest-ever finish at Monza in 1971, where he finished fifth - just six tenths behind winner Peter Gethin. 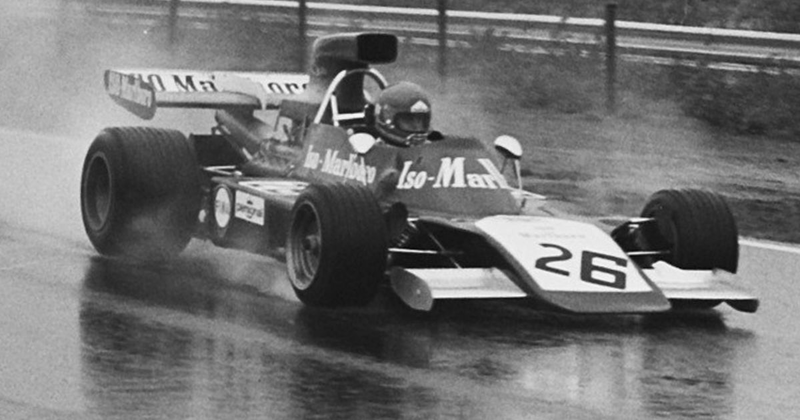 His best finishes were a pair of fourth places while driving for BRM but he almost won for Frank Williams at a soggy Canadian GP in 1973 - albeit by mistake. That race saw the first use of the safety car in F1 and it was a complete mess - Ganley was fifth at the time but organisers sent the safety car out ahead of Ganley, thinking he was leading. Once the race had finished the circuit announcers mentioned Ganley as the winner, though studying of the lap charts declared Peter Revson as the official victory. Ganley was officially placed sixth, although his own team’s lap charts thought he’d won while Ganley himself believed he was third. Who knows where he actually ended up! Warwick Brown (born 1949) started just one race, the 1976 US GP at Watkins Glen, driving a Wolf-Williams. He qualified 23rd and finished 14th and last, five laps down on winner James Hunt. Top image (c) Anefo/Creative Commons. It’s also actually of Ganley’s teammate, Gijs van Lennep, at the Dutch GP in 1973 - just squint a bit and you can pretend it’s Ganley on his way to finishing… somewhere… in Canada later in the year.